Hello. First, I just want to say hi to my stamping friend in Arizona, Cathy, and by now hope that she is getting some relief for the water leak in her stamping room! I'm thinking of you girlfriend! 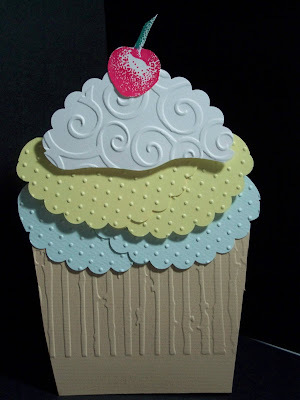 I made this cute little card, all from cardstock I put through the cuddlebug folders and my bigkick! The bottom is the wood grain, just folded in half, and the layers are swiss dots in two colors, with a 3 inch scallop punched out and cut in half, and the top is the swirls, also punched out with the 3 inch scallop punch, and cut in half and shaped. The cherry is an old PSX stamp! What a cute little card to brighten someones birthday!